Firefighters face incredible risks on the job, rushing into buildings and encountering heat, flames and high levels of carbon monoxide. A team of UIC undergraduate seniors in electrical and computer engineering wants to make the profession a bit safer with a remote-controlled robot that can scout a fire ahead of humans. Their creation, FlameBot, can be deployed by fire departments and, within seconds, send video from inside a burning building to firefighters before they enter. It also can relay critical data such as CO levels and internal temperature. 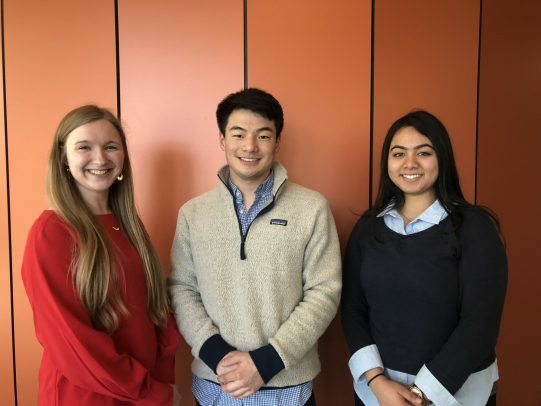 The team of students — Megan Dague, Zachary Hellriegel, Sanjida Choudhury and Cary Pope, known as ZMCSolutions — will present their proof of concept April 26 at UIC’s annual Engineering Expo, part of the two-semester Senior Design course. The Expo is the culmination of the course, allowing students to use the knowledge and skills they’ve acquired during their four years at UIC to solve a real-world problem. Choudhury said before designing the prototype, the team spoke with firefighters in the City of Chicago, Niles, Morton Grove, Lincolnwood, Skokie, Lake Villa, Antioch, Waukegan and Round Lake to see which tools would be of most value to them. The FlameBot firefighting robot prototype, currently under construction at UIC’s Makerspace, will have a temperature and gas sensor, camera, and rechargeable battery. It will be controlled via laptop and is designed to be used multiple times. FlameBot is designed to arrive inside a building about 15 to 20 seconds from the time it’s deployed. The prototype for Expo will not be fireproof due to cost and time constraints, but the team has looked into the necessary components to add that feature. The students look forward to sharing their findings with the fire departments they worked with. After graduation, all four students plan on finding full-time jobs in the robotics and electrical engineering fields.